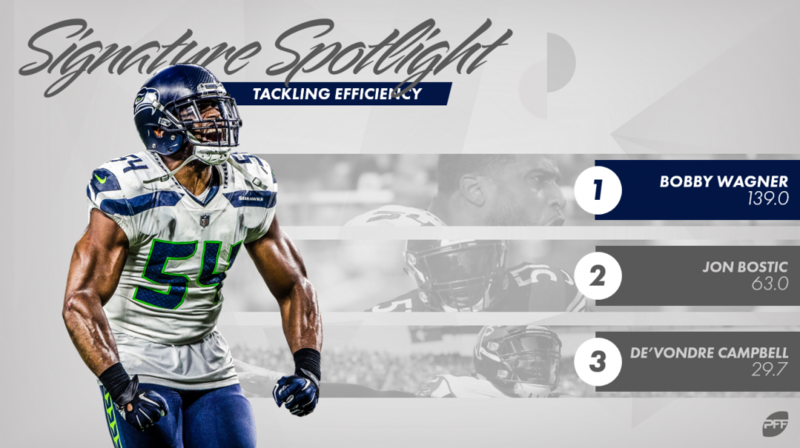 Moving on to linebackers in our Signature Stat Spotlight series, we’ll discuss tackling efficiency (attempted tackles per miss), run-stop percentage, passer rating allowed, yards after the catch per reception allowed, pass-rush productivity among other advanced stats tied to linebackers in PFF’s Premium Stats 2.0. PFF charts defensive stops on passing and running downs, which are recorded when a defender makes a tackle (includes sacks) and limits the offensive player from gaining 45% or less of the yards needed to move the chains on first down, 60% or less on second down or prevented from picking up the first down on third/fourth down. We then calculate the run-stop percentage (defensive stops recorded on running downs/run-defense snaps) from our stop charting for all defenders, including off-ball linebackers. In addition to the above metrics, I’ll also dive into first contact percentage, forced incompletion percentage and PFF’s advanced positional charting that tracks where all defensive players, including off-ball linebackers, line up on every play. Bobby Wagner, who finished the regular season as our highest-graded off-ball linebacker, took efficient tackling to the next level in 2018. The Seattle Seahawks’ prized veteran missed just one tackle across his 892 defensive snaps and 139 tackle attempts in 2018. For added perspective, Pittsburgh Steelers’ Jon Bostic finished second in PFF’s tackling efficiency, missing one tackle and recording a 63.0 tackling efficiency. Wagner finished first with his 139.0 tackling efficiency. Bringing up the rear, Cleveland Browns’ Joe Schobert missed 24 tackles across his 110 tackle attempts in 2018, giving him an NFL-low 4.6 tackling efficiency among the 71 off-ball linebackers with 400-plus defensive snaps. Carolina Panthers off-ball linebacker Luke Kuechly ranked just 17th in tackling efficiency with his nine missed tackles across 140 tackle attempts, but he did finish the season with an NFL-high 12.0 run-stop percentage. Logging 39 defensive stops in 325 run-defense snaps, Kuechly also led all qualifying off-ball linebackers in run-defense grade (92.3) in 2018. Here, Kuechly flows with the run to the right, avoids the (admittedly poor) second-level block and sifts through the trash to bring down Detroit Lions’ LeGarrette Blount for a tackle for loss on second down – a run stop, if you will. Kuechly and Wagner both excelled in coverage, as well. But it was Buffalo Bills’ Matt Milano that led all off-ball linebackers with 300-plus coverage snaps in passer rating allowed (67.0) in 2018. He also ranked tied for 10th in yards allowed per coverage snap, which is also tracked in Premium Stats 2.0. Oakland Raiders’ Tahir Whitehead ranked last among the 49 off-ball linebackers with 300 or coverage snaps in passer rating allowed (146.5), giving up 602 yards and seven touchdowns while in coverage. Because linebackers so often defend passes thrown behind the line of scrimmage, tracking how many yards after the catch a linebacker allows can provide a clear picture as to how many yards the pass-catcher is adding after the catch with the linebacker in coverage. Indianapolis Colts’ Anthony Walker led the aforementioned group of linebackers with his 4.41 YAC per reception allowed average. In the play above, Walker chases down Jacksonville Jaguars running back Leonard Fournette after he catches the short pass behind the line of scrimmage and tackles him for a short gain on second down – logging a coverage stop and limiting Fournette’s YAC on the play. Forced incompletion percentage, which takes all forced incompletions (pass breakups, interceptions, tight coverage) and divides them by total targets, is also tracked outside of Premium Stats 2.0 and sometimes referred to in our articles or social graphics. Shortened to FINC% at times, this statistic gives us a great idea of which defenders make plays on the ball at the highest and lowest rates. Among the 68 off-ball linebackers targeted 30 or more times in 2018, Schobert ranked first in forced incompletion percentage at 15.2%. Wagner finished second at 14.3%, while five of the 68 linebackers (Austin Calitro, Dont’a Hightower, Kyle Van Noy, De’Vondre Campbell, Myles Jack) forced zero incompletions this past season. Measuring performance across run and pass downs, PFF charts which defender makes first contact with the ball carrier on every play. This gives us an idea as to which players are always around the ball and often the first to it regardless of whether they secure the tackle or not. Dallas Cowboys rookie linebacker Leighton Vander Esch owned this stat in 2018, as he was the first to make contact with the opposing ball carrier on 15.1% of his defensive snaps. No other off-ball linebacker with at least 400 defensive snaps played finished above 12.6%.